This post would be far more appropriate for Garden Bloggers’ Foliage Day, if there were such a thing, because decent-looking blooms are pretty much non-existent here at Hayefield. 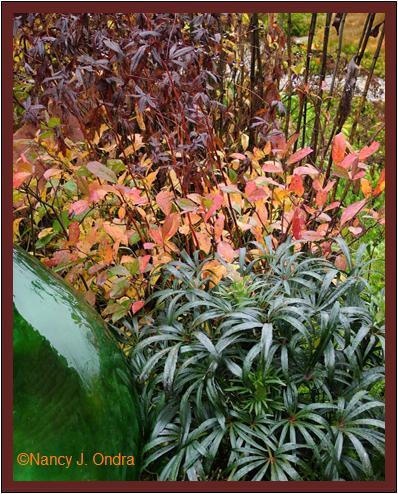 There’s beauty to be found even without flowers, however, so here’s an overview of some autumnal offerings from our part of Pennsylvania, starting above with the foliage of ‘Pardon Me’ daylily (Hemerocallis) arching over creeping bramble (Rubus rolfei; a.k.a. R. pentalobus or R. calycinoides). 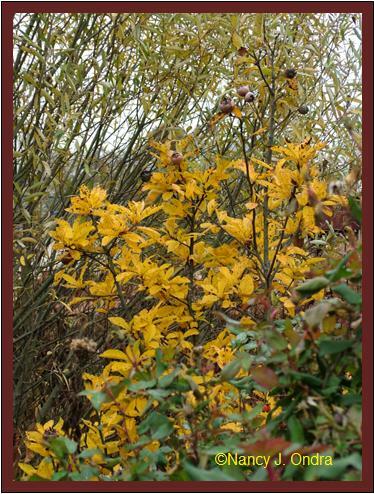 Another dependable perennial for fall color, the Arkansas bluestar (Amsonia hubrichtii) hasn’t been as spectacular this year as in some past seasons, but the bright yellow has still been welcome during the recent spell of dreary weather. Above, it’s paired with the light green leaves of Euphorbia oblongata and the white stems of ghost bramble (Rubus thibetanus). 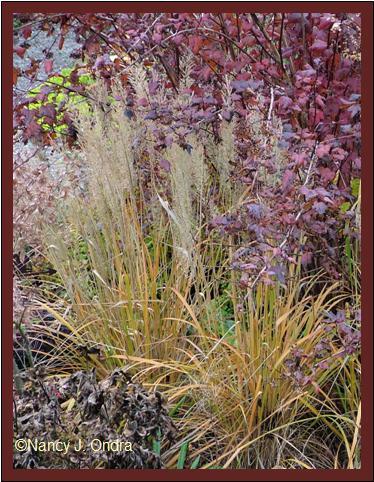 The grasses, too, are putting on a show of good form, as well as contributing some color. 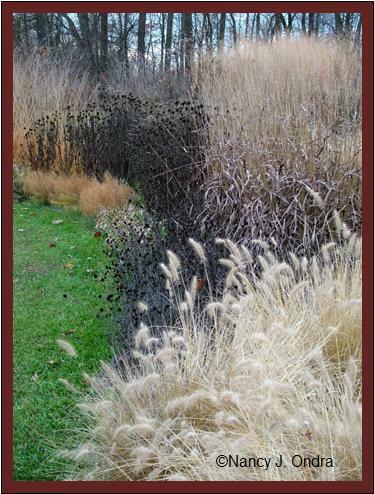 Below is Korean feather reed grass (Calamagrostis brachytricha) with Diabolo ninebark (Physocarpus opulifolius ‘Monlo’). Prairie dropseed (Sporobolus heterolepis) has finally turned its typical orange, made even prettier today by the sparkling dewdrops on the remaining seedheads. The Arc Border is pretty much bleached and blackened, but it’s still full of structural interest. Before the rainy weather moved in, there were plenty of fluffy seedheads left, such as these of a hybrid ironweed (Vernonia). 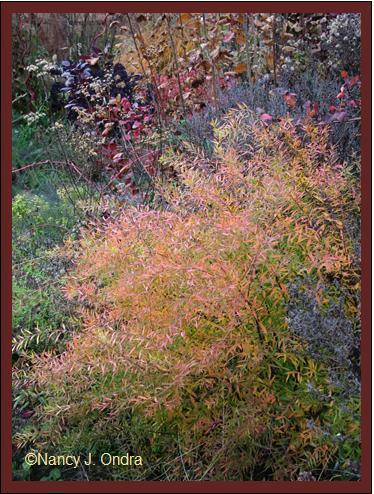 Fall color from the deciduous trees mostly finished a few weeks ago, but a few shrubs are still showing off, such as the always-spectacular Mellow Yellow spirea (Spiraea thunbergii ‘Ogon’). In the side garden, the southern bush honeysuckle (Diervilla sessilifolia) is trying to keep up with the spirea, but I doubt it’s going to color up any better than this unless we get some sunshine soon. The ‘Frau Dagmar’ rose was a clear, bright yellow a week ago, but a few orange tints came in before it dropped most of its leaves yesterday. …and the ‘Henry’s Garnet’ sweetspire (Itea virginica), shown here between the deep green of Helleborus foetidus and the deep red of Bowman’s root (Porteranthus stipulatus). But the medlar (Mespilus germanica) surprised me with an eye-catching display of gold this year. I don’t remember it being so colorful last year, but then it was rather shorter, so maybe I just didn’t see it. 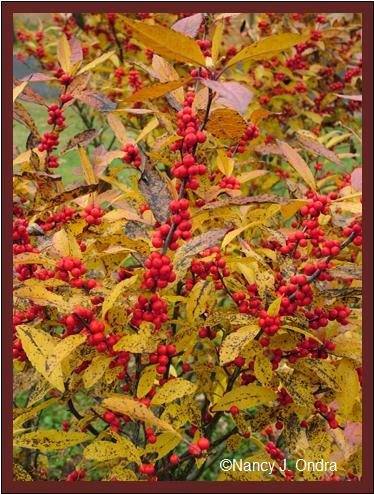 To finish, a shot of ‘Winter Red’ winterberry (Ilex verticillata). It looked like this for exactly one day, until the deer descended on it. It was nice while it lasted, anyway. Now, I can only wonder what, if anything, might be left by next month. In the meantime, I look forward to visiting everyone else’s Bloom Day posts, thanks to Carol at May Dreams Gardens. I hope you’ll join me! You have all those sweeping lines again in your images, making it look like paintings. Vernonia, am I right in thinking that somebody has linked this with a cure for diabetes? Because animals use it when their glucose levels rise too high? Thanks, Joco. I haven’t heard about that possible use for vernonia; I’ll have to spend some quality time with Google to check it out. I like all the color and form you have in your November garden Nan. It has been raining here the past three days so I don’t have much to offer in my garden. There is ice tapping at my window this morning. Brrrrrrrrrrrr. We’ve had the rain too, Lisa, and that cold is heading our way. I guess that signals an end to the planting season. I,m sorry Nancy but we cant show enything nice in our garden for Bloom Day in November. We just wait for the snow so we can get some light and clean. Poor Ken. After seemingly endless days of fog, drizzle, rain, and now thunderstorms, I’m thinking a nice clean blanket of snow would be lovely here too. And we may actually get some next week! Although devoid of blooms, your garden still looks wonderful! My garden was at about that point last week, when I went crazy snapping photos of everything, especially the Physocarpus. I always forget that the leaves turn that fantastic deep red. I love how some things seem to glow with an inner light, such as the Itea & the Cotinus. I too am frequently surprised by the physocarpus, because I think of it being basically black. 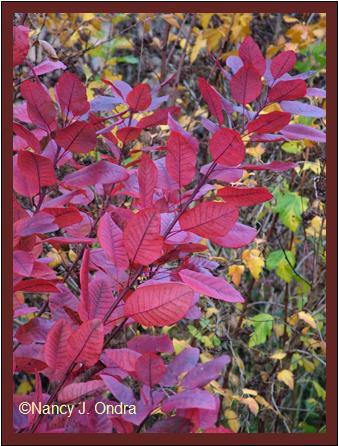 But when it gets those rich red seedpods in summer, and then the red fall color – mmmmm! I am not sure where to start! The garden is still beautiful and isn’t that what we want…bloom or not! Lovely lines and textures to please the eye? Movement in the planting to sweep our attention toward showy groupings! Just lovely. Thanks, Gail! I wish I could take credit for that combo, but I planted only the itea; the porteranthus and the hellebore moved in on their own. It’s awesome what magic plants can make if given the chance (in other words, if one is a bit lazy about deadheading). I am enamored with your autumnal offerings, Nan. They are stunning. That arc border is a picture to paint. So many great colors in the foliage. Good thing you captured the winterberry just in time. the medlar and the sweet spire are a sure fave. I’ve looked to no avail for some type of ironweed to grow down here… I’ll keep looking. Your garden is one of the most beautifully laid out and tended in the spring/summer… it must be difficult each fall to watch it fade away. And yet, it is still beautiful in all its changing glory and gives you much to look forward to in the spring. You always have such lovely comments, Meems. Actually, I like fall the best of all the seasons, for the very reason that it’s a time I can admire the garden without feeling guilty about all the stuff that needs to be done. In spring to early summer, there’s a desire to have everything looking perfect. But by autumn, I accept that perfection has once again eluded me, and I can fully enjoy whatever I get. There is so much beauty found in foliage. You’re quite right, Darla! Thanks for visiting today. I hope to eventually capture the beauty of the rain in a photo as you have here. I have a lovely British cookbook with recipes for using medlar. Do you ever use yours in jams and such? First I’d have to figure out when to harvest them. I’ve tried leaving them in the tree through some frosts to soften, but…well, let’s just say that the results were not tasty. I guess I could try to pick them and set them in a cool place to do the “bletting” thing. But then, they’re so neat to look at on the plant that I kind of hate to take them off. Nan, you have tons of color! These photos are just stunning. You capture the feel of fall so well. Thank you, Sarah. You’re right that there’s lots of color here still – it’s just not in flowery form. But that’s ok! I enjoyed looking at your beautiful gardens. I have amsonia, too, and it is one of my favorite flowers. I haven’t heard of creeping bramble, but I really like it. It reminds me of coral bells or perennial geraniums. Welcome, Sue! Thanks for visiting today. I too like the creeping bramble; it’s not an “oh wow” plant, and it seems a little finicky about getting established, but once it settles in, the carpet of foliage is really handsome. And can you tell me a little bit about that ghost bramble? 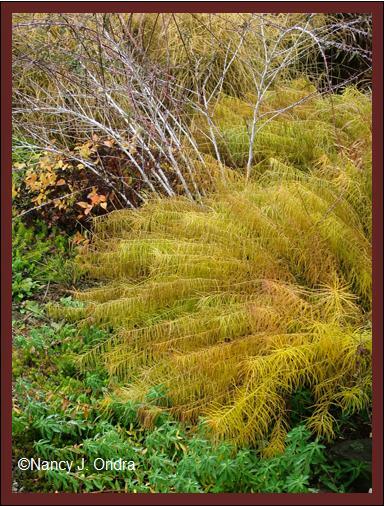 Ever time I’ve seen it in a fall/winter photo (which is usually in a British garden) I’ve wanted it… but have heard that it can really run wild on you. Is that just true in temperate British gardens, not so much here in our colder climates? Or do you rein it in somehow, or just deal with it since you have more space there? Thanks, Kim. Uh, no, I can’t really take credit for planning how the winter structure would look; it’s more the angle I shot from. But thanks for the compliment. The ghost bramble…well, I’ve heard that too, but for me, I’d call it a gentle spreader. It’s been in place 7 or 8 years now and gives me just a few offsets a year. Its reduced vigor may be due to the less-than-ideal conditions: no supplemental watering, lots of competition from its companions, and full shade until early afternoon followed by baking sun from then until sunset. I also cut mine to the ground each spring, which seems to control its size and vigor. At work, we planted one a year ago, and it is *way* more vigorous and sprawly, to the point where it’s starting to tip-layer, and I could easily see it making a large colony by next year. But there, it gets regular watering, both sun and bright shade, and very rich, evenly moist soil. You have proven, once again, that there is no need for blooms in order to have an interesting garden. Fall interest involves more than a cup of tea and a few good books. I heartily agree with you about fall interest, Layanee. But after spending the day out in the mud and wind, I’m thinking a cup of tea and a good book sound really nice! I agree with layanee that blooms are not absolutely required to have a beautiful and interesting garden. My first garden mentor, Elsa Bakalar, had magnificent English perennial borders. Then I spent two years in China and came away with an appreciation for a very different aesthetic. Stone and water and lots of green with just a few important bloomers. I do have lots of peonies and three tree peonies as a result. Hi Nan, as always your photos and combinations are a dream. Like Kim, your arc border has captivated me. Every one of those spent stalks has great form and interest, who needs color with those around? Not me. I could study that photo for days. And all of them honestly. I moved the amsonia this week and divided it, with a handsaw! I know you need a swath of it to achieve a look similar to yours. Of course everything should be mass planted. Next garden! You are a brave woman, Frances, to divide an amsonia! I take the easy way of letting mine self-sow and then moving the seedlings when I need to fill a new area. Even without blooms your garden has a lot of interest to show! I really like those winterberry hollies. I saw some recently at a nursery but I wasn’t sure if the nursery had the male counterpart and decided to wait on them for a little while. That smoke bush looks great too. I’ll have to get one for my daughter since they share the same name, ‘Grace’! The winterberries *are* wonderful, even though they’re apparently deer candy. 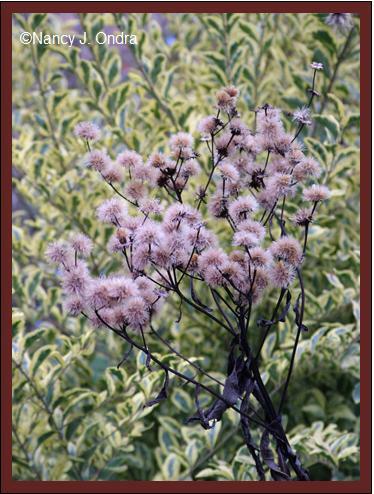 You definitely need to get your Grace a ‘Grace’ smoke bush of her own. Such a lovely plant (and a lovely woman too, I’m sure!). 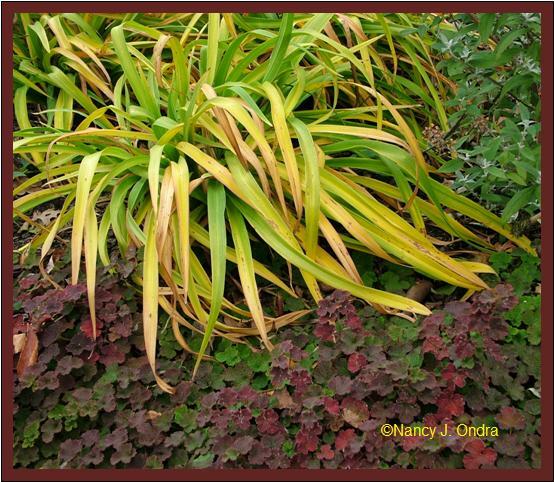 You have such an incredible eye for perennial beds and fall colors Nan. I’ve been reading your book, Fallscaping, and getting ideas galore. It’s great to see how different years produce different results too. I love it all! Thank you, Jean. 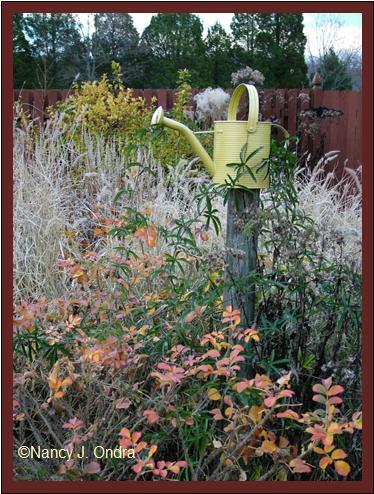 One advantage a blog has over a book is that one can continually update the photos as a planting matures. 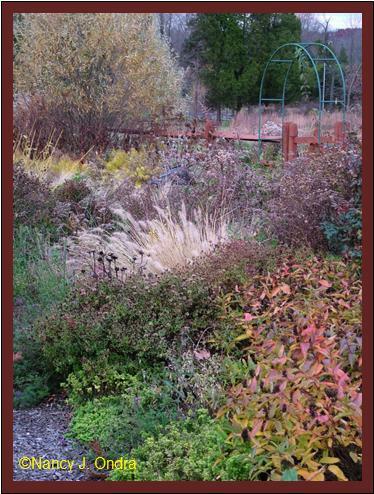 The comments on this post have encouraged me to plan some “over the years” posts for this winter to show how some of my favorite borders change through the seasons and through the years. These photos have taken my breath away! I hope you get to enjoy your gardens as much as you would like! The contrasts in color, line, texture… Wow. Thank you for sharing!! Thank *you* for visiting, Shady. I’m glad you enjoyed the images. Well, at least you got two – it’s a start! (Thought not much of a show, admittedly.) Maybe your females need different boyfriends? What beautiful foliage, and I enjoy that as much as the blooms. I try to remember this when buying new plants for the gardens. 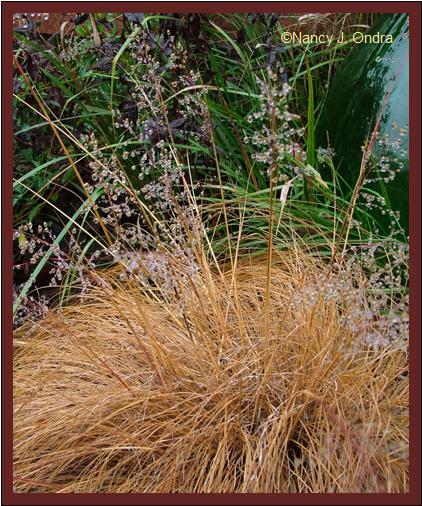 The prairie dropseed is gorgeous! Yep – if the foliage looks good, then the blooms are a bonus! I’m echoing Gail – I don’t know where to start. Your borders are so full of vivid colors, Nan! You have so many plants I haven’t yet tried. I feel like a kid in a candy shop! Beautiful photos of your gorgeous combinations. I’m so envious that your have hellebores sowing themselves when I can hardly get one to grow! Thanks, Kerri. I hope you find a few hellebores, at least, to grace your garden. I remember doing a presentation on hellebores for a plant study group nearly 20 years ago, and one of the participants complained about having to pull out hellebore seedlings by the hundreds. Needless to say, the rest of us were floored (and envious). But now, I’m finally starting to notice dozens of seedlings per year. So, if you can get a few established, I’m, sure you’ll eventually get some self-sown seedlings too!